The Brian Center is located along the bank of an urban creek in downtown Waynesville. The stream bank was failing to the point of threatening the parking area and the Army Corp of Engineers was concerned about the on-going erosion. 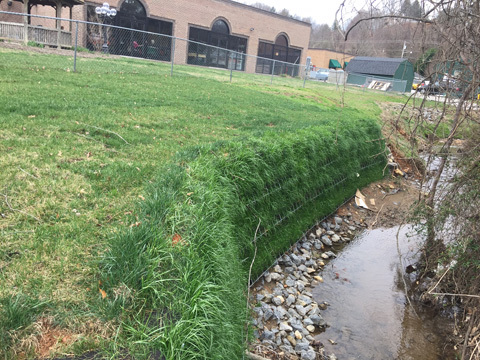 BEA implemented a relatively new type of “living wall” technology for re-establishing the stream bank in sections. The Filtrexx wall system allowed for quick and easy installation as well as minimal stream disturbance. The natural face of the stream bank is also preferred to gabion walls and other non-natural retainage systems.